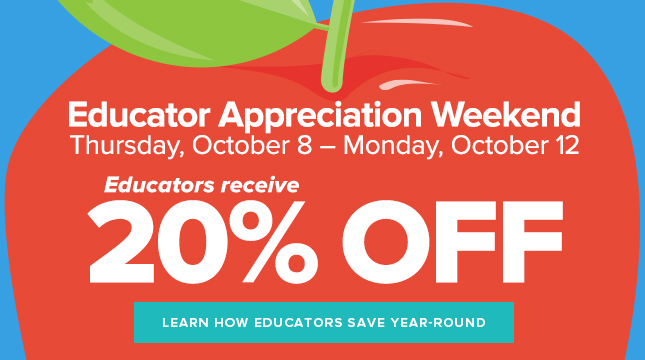 Half Price Books Educator Appreciation Weekend (10/8 – 10/12) 2015 ~ 20% OFF Coupon! As a Homeschool mom, Half Price Books has always been a favorite go-to place for me to get curriculum ideas. They also offer a great Educator Program which saves you 10% on your purchases all year long. If you are a teacher, be sure to take advantage of this great program. All you need to do is tell your HPB sales associate you would like to sign-up for the program. Educators save even more this Thursday (10/8) thru Monday (10/12) with this COUPON for 20% Off! Print yours and go shopping!